NEW BRITAIN - Prior to Monday night’s game against Plainville, New Britain girls basketball head coach Marc Wesoly stood in front of the scorer’s table, microphone in hand, and called senior Brianna Clarke’s name. 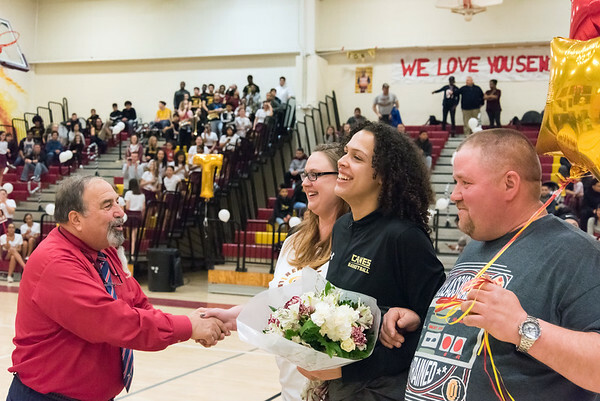 As gold balloons with Clarke’s name and initials swayed back and forth along the railings of the bleachers filled with cheering fans and students, Clarke emerged through hanging white streamers from the hallway outside, arm-in-arm with family members while more trailed behind, holding up pictures of Clarke as the senior made her way to halfcourt to greet her coach and be honored for Senior Night alongside teammate Toni Mills. Clarke kept a smile and embraced her fellow graduating teammate and her second-year head coach before posing for pictures. On an emotional evening, Clarke kept her composure for the main festivities, but that was only because she let the emotions flow well before the ceremony began. Clarke, also a member of the band that showered her with music after her name was called on Senior Night, couldn’t help but be overwhelmed by the appreciation her and Mills were shown on the duo’s last night wearing their home white jerseys. A four-year player for New Britain, Clarke has said goodbye to her home supporters, and will soon do the same to her teammates when the season draws to a close. For Clarke, again expressing plenty of emotions after Monday night’s game, her unforgettable experience as a Hurricane makes it that much harder to say farewell. Wesoly, Clarke’s coach for the past two seasons, understands the void Clarke will leave behind stretches far beyond the hardwood, especially when it comes to someone who has made just as great an impact on the school as a whole. Even without Clarke’s unmatched height, Wesoly knows her accolades make her stand out at New Britain, which will miss her when she’s gone. Posted in New Britain Herald, New Britain on Tuesday, 5 February 2019 19:20. Updated: Tuesday, 5 February 2019 19:25.